To address the communication concerns and needs of state, local, and territorial health communicators, as well as partner organizations, CDC is hosting a series of Crisis and Emergency Risk Communication (CERC) teleconferences related to Zika issues. The majority of tornadoes occur between the months of April and June. 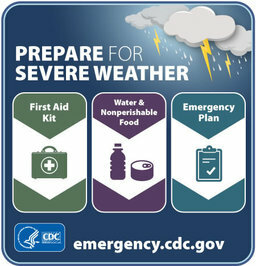 To stay safe during a tornado, prepare a plan and emergency kit, stay aware of weather conditions during thunderstorms, know the best places to shelter both indoors and outdoors, and always protect your head. During April 27-30, 2014, a series of deadly tornadoes destroyed parts of central and southern United States, killing 35 people and injuring over 300. From May 5-10, 2015, 127 tornadoes caused injuries to 69 people and killed 7. As of May 24, 2016, there have been 60 total tornadoes during this month. According to the National Oceanic and Atmospheric Agency (NOAA) , there is no guaranteed safety during a tornado. Indeed, we must take seriously even the possibility of a tornado. Although the most violent tornadoes can level and blow away almost any house and those within it, extremely violent EF5 tornadoes are very rare. Most tornadoes are much weaker. 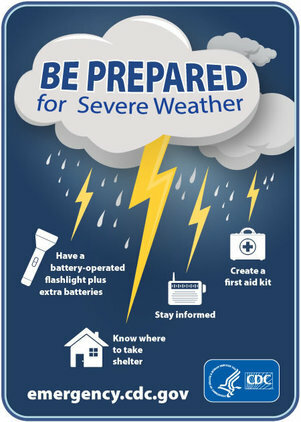 You can survive a tornado if you follow safety precautions. Here are three important tips to help keep you safe. Make sure your children know what a tornado is, what tornado watches and warnings are, what county or parish they live in (warnings are issued by county or parish), and what constitutes a location as a "safe shelter," whether at home or at school. 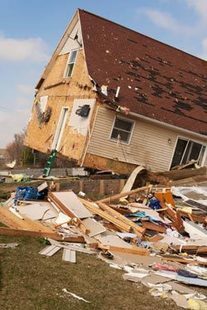 Falling and flying debris causes most deaths and injuries during a tornado. Although there is no completely safe place during a tornado, some locations are much safer than others. If you are outside or in a mobile home, find a nearby building preferably with a basement. If you are in a car, do not try to outrun a tornado but find the nearest sturdy building. NOTE: You may need to change your plans and change locations when the tornado watch is issued. No one can know a tornado's strength before it touches down, so keep up with local weather information, especially when thunderstorms are forecast. Prepare your home and family for the possibility of a tornado. Moving to shelter quickly is easier when everyone knows where to go, whether in your home or outdoors. Following these tips will give you the best chance for staying safe in a tornado. 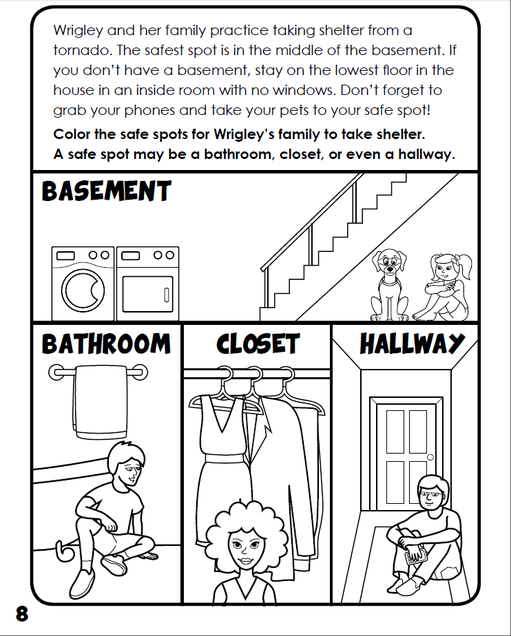 An Activity Book for Kids: "Ready Wrigley Prepares for a Tornado"
CDC released the latest Key Messages for Zika on May 25, 2016. To access these Key Messages, click here for English and here for Spanish. Please note that the Spanish version is delayed by one week. This edition of CERC @ Work features the experiences of Lisa Briseño, a CDC health communicator, as she traveled to Puerto Rico to respond to the local spread of Zika virus disease (Zika). I’m headed to Puerto Rico. I have CERC training and experience. I speak Spanish. I’m Latina. I should be ready to communicate anything. And, yet, I know that the best thing for me to do when I arrive is to LISTEN. Taking the time to listen, to watch, and to learn can be quite challenging when people look to you to have the answers--when they expect you to know what they should do. This is especially true during a public health emergency. So, how do we determine how much time to spend listening and who to listen to? 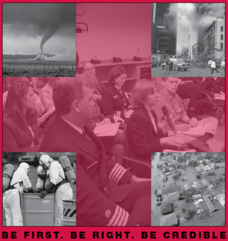 What do we, as crisis and emergency risk communicators, do? Unfortunately, the answer to how much time we should spend listening is complicated. During every phase of a response, gathering audience feedback is essential to know whether the right messages are reaching the people who need them. We have to balance that reality with the reality of limited resources. One way is to maximize the use of the tools we can access. Publicly available analysis tools for search engines, social media, and government data can provide insight to guide our decision-making. Partners often gather information and establish connections in fulfilling their missions. When we connect with them, we can share what we know to help information flow more freely. We also need to carefully consider where to listen—and to whom. Of course, we want to get public health messages to as many people as we can, but there are those people who are just more difficult to reach. Seek out those who are less prone to asking for help or information. Find out who they trust for information. And listen to those trusted sources to find out whether the questions you’re answering are the same ones people are asking. Find out whether the public health recommendations are feasible for the many and the few. But what do we do in the meantime, when people need us to communicate? What do we do while we’re building relationships, asking questions, and searching for data? If we are in the midst of a crisis, we have to use the best information we have on hand—we have to use what we do know. While we may not know which media Puerto Rican women prefer, we do have data on which media Latinas prefer. We also know how to reach pregnant women. And we know that reaching out only to the pregnant women will not be nearly as effective as reaching them AND those who care about them. So, as we continue to listen to and work with the people living in or visiting Puerto Rico and other areas affected by Zika, we learn more about how to protect those most vulnerable to Zika’s effects. We listen so we can do our part to save lives.